80% of fires are caused my wiring, a handyman improperly installed this receptacle. Now I should probably clarify something about the receptacle on the floor. A handyman illegally and improperly installed a normal duplex receptacle in the floor. None of his installation methods were safe or proper. There are floor receptacles with approved floor boxes and approved covers for the particular floor box, this one was not an approved type of box for the installation, neither was there a cover. How does one install a receptacle on a kitchen floor and not think there will be a problem? It was just another handyman job butchered up for an unsuspecting homeowner. Just because a handyman may know enough about electricity to make a light turn on or a receptacle provide power for a load that does not mean the handyman job is safe for people or the building. 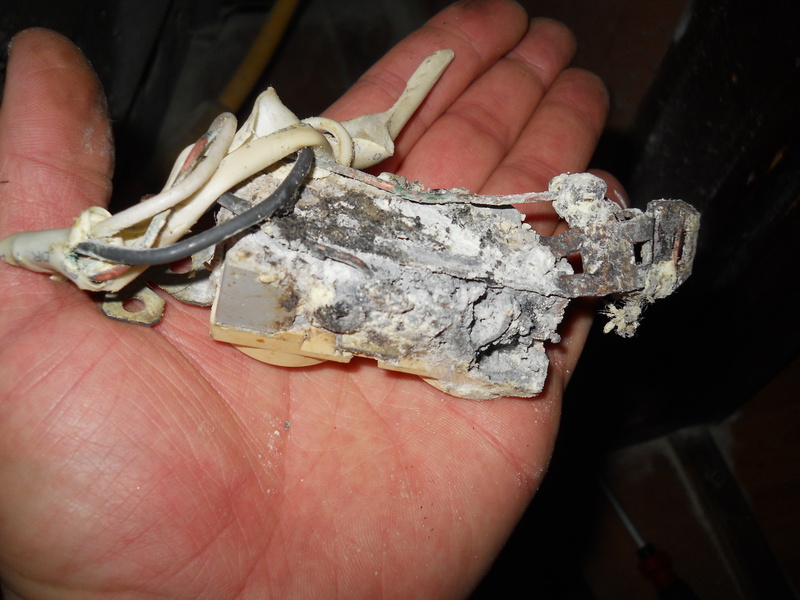 Bad wiring or improper wiring installation causes 80% of electrical fires. Is it worth getting a cheap electrical installation at the risk of burning down the house? I do not think so, but this customer inherited this problem when she bought the house. It was a normal cut in box for a wall with a normal duplex receptacle. Since this receptacle was on the floor, it was only time before something would happen, and it did, twice. When I first looked at the receptacle, I looked at a pile of fire extinguisher powder. Either the homeowner or the MFD emptied a fire extinguisher to smother the smoke and fire coming from the burned up electrical receptacle and insulation on the wire. The circuit breaker never tripped when the receptacle was burning up. The MFD turned off the breakers, that’s the first thing the home owner should have done but under the panic of a 4th of July fireworks display coming from the receptacle, the thought never entered the panicked homeowners mind. The MFD turned off all of the power for both units of this duplex. If this kitchen receptacle had the proper GFCI receptacle, the GFCI would have tripped. Any electrician knows this, a handyman often does not. Most home owners have the sense not to work on their own wiring, it seems to me most handymen have not come to that understanding. When I got there, the floor receptacle had indeed burned up pretty badly and it had the typical burned carbon smell. I removed the burned up receptacle and cable. I let the homeowner smell the receptacle for future reference; it had the classical electrical carbon burn smell that electricity always creates. After I snipped the receptacle and cable out of the box, I went down to the basement and found the box. I pulled on the cable and it fell right out of the box, the handyman never secured the electrical cable to the cut-in box he unfortunately installed in the floor. I removed the 15-amp cable to the first junction box. I turned on the circuit breakers for both units of the duplex and the power was restored, the lights came on, and the alarm made its beep. I wrote up a proposal for a new 20 ampere, 120-volt circuit with a GFCI duplex to be installed in the wall above the gas range. It is typical for a handy to create an unsafe electrical condition. Electricians go through an apprenticeship for a minimum of 4 to 5 years but often several years. Besides the apprenticeship, continuing education is required to maintain one’s credentials. The national Electrical Code, NEC, updates and changes every three years. States and local communities will also modify their codes to comply with the new codes but they are usually more restrictive than the NEC. The NEC is nothing but the minimum standard allowed for an installation. A handyman installation never meets the minimum standard for a safe electrical installation. Are you safety worth having a qualified electrical contractor send his qualified electrician or electricians to your home or business? For me and my house, I only want qualified electricians doing electrical work. This entry was posted on Wednesday, August 3rd, 2011 at 2:25 pm	and is filed under Uncategorized. You can follow any responses to this entry through the RSS 2.0 feed. You can skip to the end and leave a comment. Pinging is currently not allowed.